When I die, I want to die alone. I want all the attention. I want a scene of sobbing friends and fainting family. I want the whole village, the neighborhood and the industry to talk about me. I want lots of "Ya haram, did you hear about what happened to Tania?" to be answered by a sudden breath in, a hand on the chest, freeze of the eyes, followed by silence. Long heavy silence. Yes I am aware that I'm sounding like a sad attention seeker but everyone deserves to die alone a natural death or in a banal unfortunate accident as opposed to be group massacred and burnt to death by Israeli white phosphorus illegally used in a horror scene that even the cheesiest Hollywood scriptwriter is embarrassed to come up with. I often thought about collecting the names of the victims as a simple act of remembrance or in order to re-act the fuss that should have been triggered by their death and defying the collective and nonexclusive brutality that the killers have forced on them. During the 2006 Israeli war on Lebanon and after the media switched from mentioning the victims names to numbers, such as "30 people died today and 55 were injured," I started collecting the names and photos of the dead and thought of using them in a performance. I ended up with an inbox on my computer full of burnt corpses and infants with half blown bodies and long months of terrifying nightmares. Today I found the names of 352 Palestinian children who died two years ago during the Israeli war on Gaza (a massacre that killed 1400 Palestinians.) Some of these children were three months old. This is the full list. Read it. 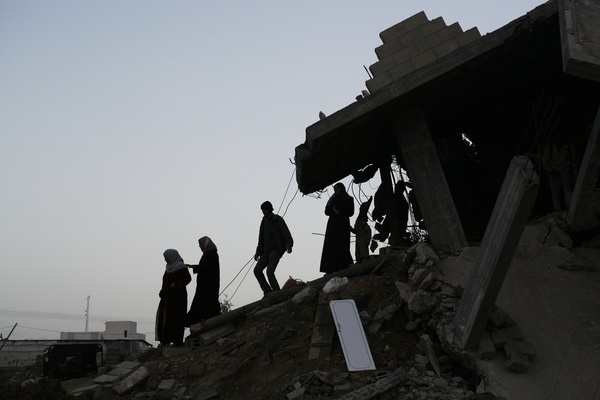 Photo by Matthew Cassel taken in Gaza.